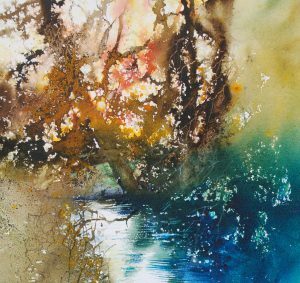 Ann’s new dvd, filmed by Townhouse Films, is based on some of the ideas and subjects from her most recent book ‘Watercolour Workshop'( Batsford). The new dvd is called ‘Experimental Watercolour Workshop’ and will be officially published on May 1. However, you will be able to place your pre-orders at the shop on www.annblockley.com before that. If you have signed up for Ann’s email newsletter an email will be sent to you letting you know when this is online. The dvd shows three very comprehensive demonstrations of some of Ann’s favourite nature subjects – with a range of exciting techniques and thought provoking ideas to inspire you.